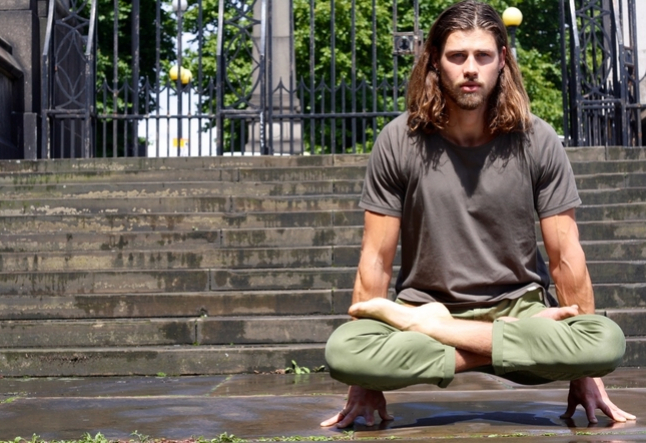 Jake Wood, founder of men's yoga attire brand 'so we flow...' discovered yoga when living in Morocco and co-owning a small internet-based branding and design agency. It came in the form of a skill exchange - daily yoga tuition for a new identity. He recalls lying in Savasana at the end of his first practice realising he'd found something he wanted to pursue for a lifetime. Fast forward several years and yoga is a cornerstone of Jake's life and inspiration for the foundation of so we flow....a way to inspire more men to get involved in movement based practices - move and open their eyes to what can be unravelled and achieved through a dedicated practice - be it yoga or something else. YOGI TIMES: So, Jake, how did you first get into yoga? Jake Wood: I ran a graphic design agency with a friend and we had this idea to move our company and start running it out of different places. We wanted to be somewhere that was in the same time zone as the UK, had surf and sun and a totally different culture. We landed in Morocco. While in Morrocco we met a yoga teacher and Michelin star chef named Oli who was setting up yoga retreats. We ended up doing a skills swap. I helped set up their brand identity with my graphic design skills and Oli taught me yoga every night for 6 months. I did my first class. Lying in savasana was the first time in my life I had loved something so much. I realised I wanted to do it for the rest of my life and to follow that path. YT: Did you have any experience with yoga prior to this? Jake Wood: I had been aware of yoga, and liked the idea of it as a lifestyle, probably in more of a superficial way. I do remember once coming to some obscure TV channel teaching yoga by accident…and just kind of doing it on the ground. But to be honest what I knew of it at that point was that it existed as some hippy spiritual thing. I didn’t even know how to access it, for me movement was very much about exercise and calisthenics back then. Morocco was a good time for me to accept yoga, I was in this skill acquisition phase…when people come to yoga they need to be ready for it, willing to accept it, surrender to what’s happening. YT: As a male teacher, how much did Oli play in your discovery of yoga? Jake Wood: I found him inspirational. He was a great surfer and did this yoga thing, I thought he was so impressive. I realised there is nothing 'girly' about yoga whatsoever! What he was doing was invigorating, there was a lot of strength in it - and not just in a physical sense. I’ve never been super masculine or 'laddy' but I did have this idea that yoga was a little fluffy. The things Oli talked about were the mental attributes. These are things everyone should experience as they represent a healthy way of being. I don’t know if men are being given these experiences in other ways. People can go through their whole lives without ever opening these doors…I’ve been doing yoga going on 4 years now and there is so much still ahead. I mean, you can achieve a meditative state from lots of activities, I think most people do. But what's different about yoga is that it brings awareness to your state and you are asked to reflect on it. YT: So how did you get into founding 'so we flow...' ? Jake Wood: I didn’t like the sportswear styles available to men. I was looking for pants to wear to yoga and men’s yoga pants were all super heavy fleece. And then there were harem pants! I ended up buying women’s tracksuit bottoms, but they didn’t have pockets (someone please fix this, thanks!) I wanted multipurpose sportswear to exist and it didn’t - so I decided to create it. It’s not just for yoga, it’s for any movement. I wanted the range to be super basic and simple. It’s not about having a huge range, I like the idea of having one pair of trousers that can do everything. I want to be able to do the splits but also go on a night out in them. The aesthetic is inspired by workwear, with light fabrics, and deep pockets, I want the clothing to steep into people’s personal style, to be understated. Everything is made in Portugal and they source the fabrics sustainably for me. It’s been a massive learning curve in terms of textiles, it’s amazingly difficult to be a sustainable clothing company. I’ve been trying to get recycled polyester, they don’t make it easy for you to find! I’m trying all the time to find new fabrics, eventually, I want it to be 100% sustainable and traceable. What’s great is that people are willing to pay more for something that is sustainable and works well. YT: How was the setting up process? Jake Wood: Last year was really tough. I moved back up North and I didn’t know what the full intention was. I got out there and got this warehouse. It was a lonely, very tricky year getting everything off the ground, full of endless lists and bills. There was nothing yoga about starting a yoga business! I’ve got to a point now where I know the process and I don’t need to worry. Looking back at the beginning, I’ve learned not to be a busy fool. When I work, I work hard, but not for long hours. It’s about freedom. Now my day to day involves meeting people in different movement disciplines, just seeing what’s out there and getting people onboard. A lot of the men I meet say the same thing, they don’t see capoeira, climbing, martial arts etc. as exercise, it’s a passion, and it’s a lifestyle. I want to spread that movement philosophy and build on the community around it! The clothing is a vehicle to carry a bigger message, part of it for me is creating a lifestyle business. YT: How has 'so we flow...' helped to facilitate the male movement community? Jake Wood: I try to create spaces for men to get involved in movement-based practices and workshops with So We Flow that are aimed at beginners. It’s easy to say no to new experiences because you’re nervous and ego comes into it. But when you’re in a room full of middle-aged men, you can let go a bit…everyone is laughing, its fun. I hope this gives them the confidence to practice this in an everyday setting. I like being a beginner, if you keep doing the same stuff you’re comfortable with, nothing changes - you need to always make yourself a beginner! For more info on Jake Wood and so we flow... - go here.